With other peoples highlight reel! I'm really guilty of doing this I'm forever looking through instagram and blogs, getting sad at how everyone's kids room seem to be so perfect, how they are able to have little things on display in their living rooms and kids room without them being destroyed, how perfect and immaculate their houses are. I read this quote out to Andy 'Don't compare your behind the scenes life with other peoples show reel' and he had the great idea of making a blog post out of it and our behind the scenes. Of course I and many others only upload the best bits and the tidy bits of the house, manage to get a photo without getting the stain on the carpet/rug in. I'm sure I'm not the only one that's guilty of having that ridiculously cluttered corner? pen marks up my walls all around the house? little mucky hand prints all down my back door windows? the understair cupboard piled high with all sorts because out of sight out of mind? a pen/paint stain on the sofa? Kids bedrooms that are a wreck until you finally muster up the courage to go and tackle it? A washing pile that's bigger than it should be? A tv cabinet that has pen marks and drink stains all over the top? One thing we are guilty of here is if there's space on it we will fill it, I want a dining table but I know it will just become another place to throw crap onto! we have a fold away one but it's barely used because it always has some kind of crap on it, The dogs cage forever has something thrown on top of it. 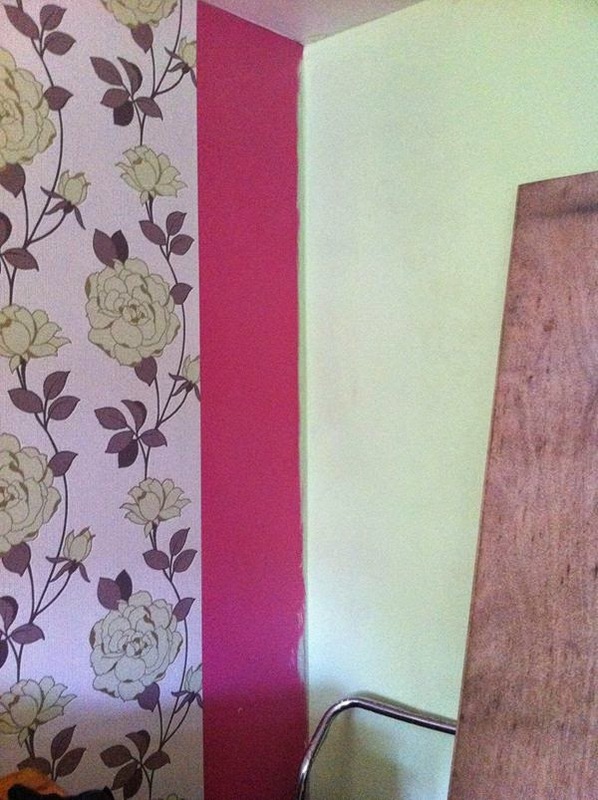 one thing that is a regular in my house is that every wall but the girls bedroom that is wallpapered has that one little thin strip missing, My bedroom still has this strip missing ^ Because I refused to buy a whole roll at £1O or so for that one tiny strip? Luckily my wardrobe is HUGE and hides it perfectly, My living room has a strip missing again I'm not buying a whole roll for the tiniest strip but my door hides it, My landing has a strip missing but I have the wallpaper for it but also have a hubby that isn't in a rush to finish that little strip and a stairway with the tops unpainted because I can't reach it. 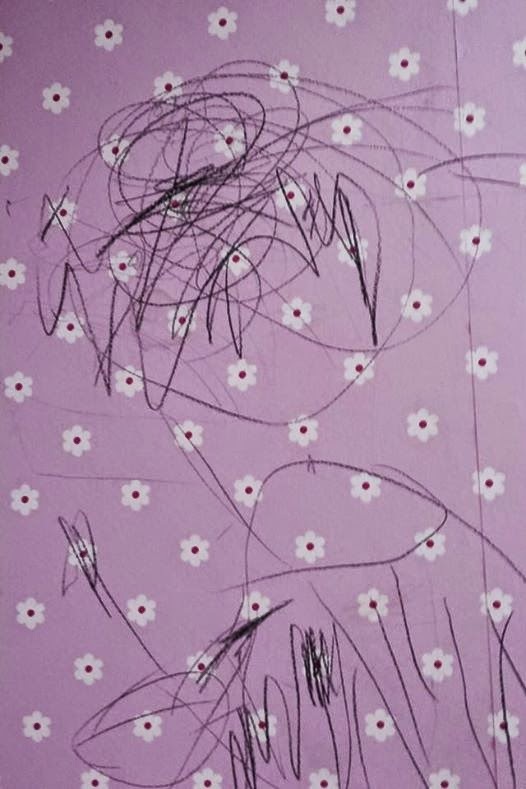 Daisie felt her room needed these lovely black crayon marks all over the wallpapered wall. These won't be covered/redecorated until we know for sure she's out of her Picasso stage. On instagram I do tend to share the new art all over the walls, the state of the girls bedroom but I do get pictures of the girls in the tidiest bit of the house without the clutter. It stayed that way for the night, the corner with the hoover is now cluttered with all of Andys bike stuff and notice the reflection in the tv of my old wallpaper still standing on the other wall? That's now gone but when my living room was at its most perfect to me it was still unfinished.